Harvard sophomore Amanda Gorman reads her work at the Library of Congress. Harvard sophomore Amanda Gorman is the first person ever to be awarded the title of National Youth Poet Laureate. 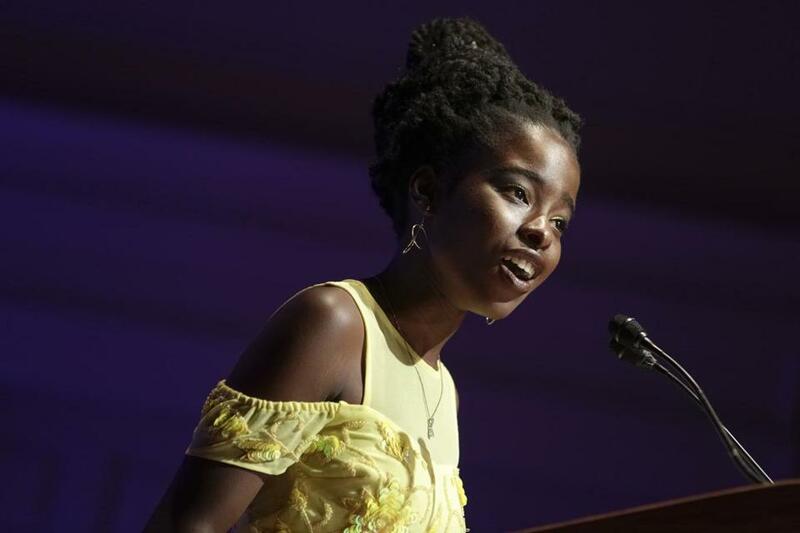 The 19 year old read one of her poems at the opening of the literary season at the Library of Congress earlier this month. But it’s far from the first literary accolade for the Los Angeles native. In 2014, Gorman was named the inaugural Los Angeles Youth Poet Laureate. A year later, she accepted an even higher honor as Youth Poet Laureate of the West, which automatically entered her to be a finalist for the National Youth Poet Laureate role. Gorman was named to the year-long position in April. We spoke with Gorman following her Library of Congress debut. How did poetry first come into your life? are you interested in now? Poetry has been the writing form that has consumed most of my life for the past few years because I’ve been youth poet laureate, but I’m always very interested in how my poetry can influence my other work. I love writing essays. I love writing novels. I love writing short stories. And across the board, no matter what I’m doing, it’s poetic. So even now I’m majoring in sociology — we’ll see what changes in the year — but when I write sociology papers, which at times can be really dry and really boring, I look at them and I usually have metaphors in there, some creative wordplay. And so it’s just really interesting to try to include the poet in me in all the other writing that I do. the youth poet laureate position itself? What’s really funny about when people ask me, “What does the National Youth Poet Laureate do?” is that it’s kind of like we don’t know yet. It’s the first time that we’ve done it, which also makes it really exciting that I get to define it as they go along. But I know that what I want to bring to the role is definitely more widespread access to poetry for youth around the country. So really give them a voice and an avenue to connect with spaces that have previously been limited to adult poets or if not white cis-male poets. I really want to open those doors for young poets. In the poem you read at the Library of Congress, you referenced Charlottesville and protests in Boston’s Copley Square. Is a lot of your poetry grounded in current events? My poetry isn’t always rooted in current events, but it’s always rooted in world or domestic events which speak to social justice and equality. I can write poetry about anything under the sun, but what calls me again and again is to use my pen lyrically in a way in which I can have a dialogue about race, about gender, about class in a way that I couldn’t necessarily do with prose. A lot of my poems will have lines and alliteration in them also like rap but not exactly, almost like a song but not being sung. I look up to Lin-Manuel Miranda for the inspiration. I was listening to “Hamilton” when I wrote the rap in my poem for the Library of Congress. As a sophomore at Harvard, how have you been balancing this position while going to school? That is the question. I do not know. My friends always ask me that because they’re like, “Amanda, you go to lunch and you don’t come back because you go to D.C.” For me, it’s really about being clear about what I want from my own life and my own education and my own happiness. If I don’t set those goals, it’s really easy to get lost. When I think about those and outline that, this whole balancing act of work and life and student and activist, it becomes quite intuitive. And sometimes I do agonize a little bit over certain things. I always feel like I might be missing out. But when making a decision, you have to stand by it because you can’t do everything. But I know that in the things that I do complete, I can have an influence not just here at Harvard, but around the country. What do you think is the next step for you? I always say the really, really long-term goal, meaning 2036, is to become president. So that’s the longest term goal I have, which means I do want to become a public servant. I’m hoping to run for a local political position in LA once I graduate from college and use my education to help the community there. I’m also really looking forward to writing and publishing more pieces that aren’t just poetry. Interview was edited and condensed. Sophia Eppolito can be reached at sophia.eppolito@globe.com. Follow her on Twitter @SophiaEppolito.